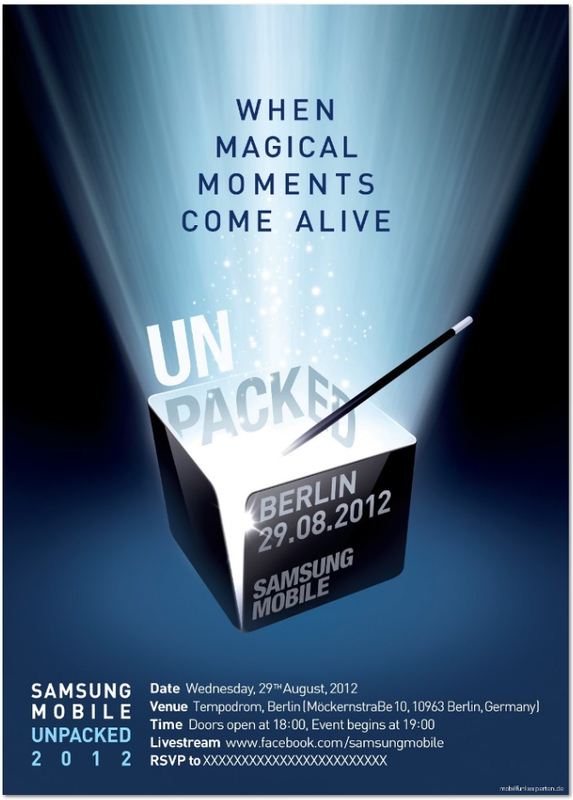 Samsung has begun sending the first invitations for IFA 2012 at Berlin. Samsung to announce something on Wednesday 29 augustes at 19:00. This is probably due to the Galaxy Note II,because if you look closely to the invitation you can see a stylus. According to the latest rumors the screen of the Galaxy II Note got slightly larger but the body a little slimmer than the original Note. There are also rumors that Samsung will come with a flexible screen. We of from SamMobile will be there in the weekend of 1 and 2 September. We can not wait to see the succesor of the Galaxy Note. In all probability, it will be the GT-N7100. Last year, Samsung showed the Note and Galaxy Tablet with SUPER AMOLED plus and bada 2.0 with a few waves. Last year at IFA they presented the Tab7.7 which they had to remove because of Apple, and now got banned in the whole EU. So this year therefore we expect the Note II and maybe that Tab with “Retina Display” that is rumored. Do you think Samsung will anounce that Jelly Bean is ready for SGS3 ? As per the ad. nothing said that the note 2 will be launched, I guess it will be a bad step from Samsung if launched note 2 now, especially that S3 has just launched and this will affect the sales of this devices, also note 1 didn’t complete yet one year! I believe the trick in ad. is the pen/stylus a top of the box.. But does not means it Note 2.. THANKS. I look forward to this with bells on. Having the Galaxy S3 is without question the BEST SMARTPHONE ON THE MARKET PERIOD. But I must join my Galaxy S3 with the Galaxy Note 2 when it arrives on Tmobile. Samsung MUST get this right and launch the Galaxy Note 2 on all carriers just like the Galaxy S3 did this past summer. Even if it’s a stagnated launch it will off set the apple iphone 5 release September 12th. We on Tmobile need this device on our 42MPS HSPA PLUS network by November/December at the latest..
It’s not IFA!! Just a press event! When can I buy the Samsung Galaxy Note II? Will it be immediately after the announcement or later?